Today was all planned. 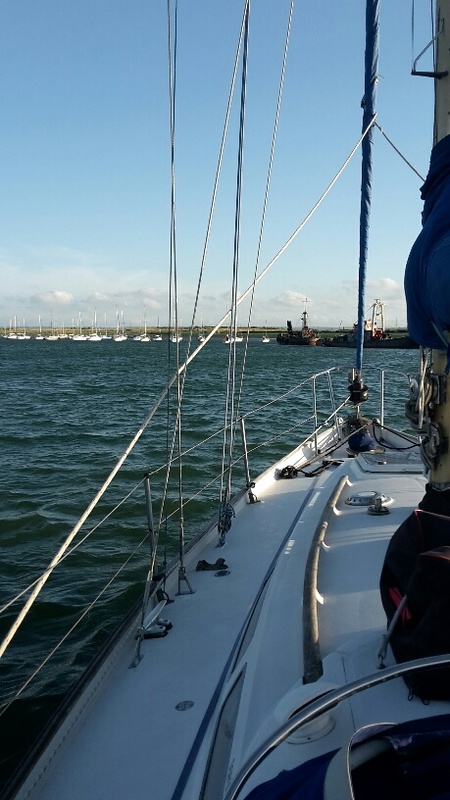 We meant to go all the way from our home port of Gillingham across the tricky Thames Estuary and to Shotley marina at Harwich. But then the inshore forecast made us think twice. Southwesterly force 5 to 7 across the shallow treacherous waters of the estuary? Maybe not today, first outing after a 10 month absence of sailing. 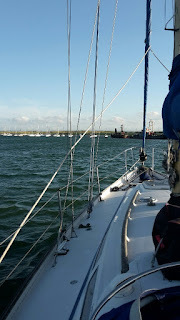 Instead we motored to Queenborough which is the only real place to stop right on the way. Only 2 hours but when we arrived to pick up a visitor's buoy there was 25 to 27 knots gusting through the narrow moorings with boats close up to the only remaining vacant buoys. Time after time Lesley lined up the boat to pass a red hulled yacht and then close in on the chosen buoy..trying to avoid being blown on to the boat and yet slow down enough for Nic to pick up the buoy. It was a learning curve which was intensely frustrating and tiring for both. At last Nic whooped with joy as he caught the warp around the buoy. The adrenalin ebbed and we had a short nap before passage planning to Harwich for tomorrow and a large bowl of pasta. All day we had been doing things uncertainly, forgetting the old accustomed ways. Tonight it feels like we are settling in, back on our beloved boat.